1. What is the system to achieve the above individually or collectively? 2. What is the time-line? 3. How the system should be used and by who? You should now that the time –frame of government (4 years) is a system or time line of government transition or voting and may not be same or right for your system. And it may be too long to base the success of your system. For example if we have voted for you- we have only obeyed the system of election, what system do we (including you) need to obey to ensure successful policy or implementation of your strategies and for how long? Campaigns should be based on selling a system and not just talking issues. A national transformation system should involve habitual human actions or technological processes that should be obeyed or used by all concerned with understanding and the expected result within a time-frame. It should also involve a clause based on patriotism or personal integrity. This is an international standard approach or guide. That is why at ARISE NIGERIA GLOBAL MISSION, we are looking for candidates in Nigeria and around the world with national transformation systems rather than campaign promises or mere issue based campaign. Issues based campaigns may come with good intentions (best case scenario). But good intention is not enough or a standard for success except and if the things that should be done are done at the right time or a system is followed. This is because every sustainable success is system based. And that would lead us to our Universal System of Leadership for Human and National Transformation which is already being put to use by some individuals and group. 3. Human Capital: i.e Building Human Capital by educating everyone and organization with incentives and how to use the system for personal success. According to the World Bank Group 2018 “without investing in human capital, countries cannot sustain economic growth or compete in the global economy”. Human Capital is the bedrock of all kinds of transformation. Human capital consists of the knowledge, beliefs, skills health and security of a people for self leadership and for national or universal transformation. Therefore without a system of human capital development, natural resources will be unutilized, untapped and national transformation or reforms will be short-lived. The Universal System of Leadership is for advancement on the educational or school system of knowledge creation for human capital development. It is based on the efficacy of time which is the Fifth Estate Realm uniting the church, government, people and the media for positive advancement and development. It is the system that influences all other systems to work better through human capital transformation, resource utilization and human leadership unity. It gives every individual an opportunity for self-development and contribution to universal transformation, peace, unity irrespective of gender or location. It enforces human rights and freedom of association, choice, and religious tolerance. It is very important to state that we have used this system though very mildly to achieve a very great result; that is a national disaster free transition/New Year Day 2019 Celebration for the very first time to be remembered in Nigeria. It has culminated into great peace and the ongoing tension-free electioneering time. 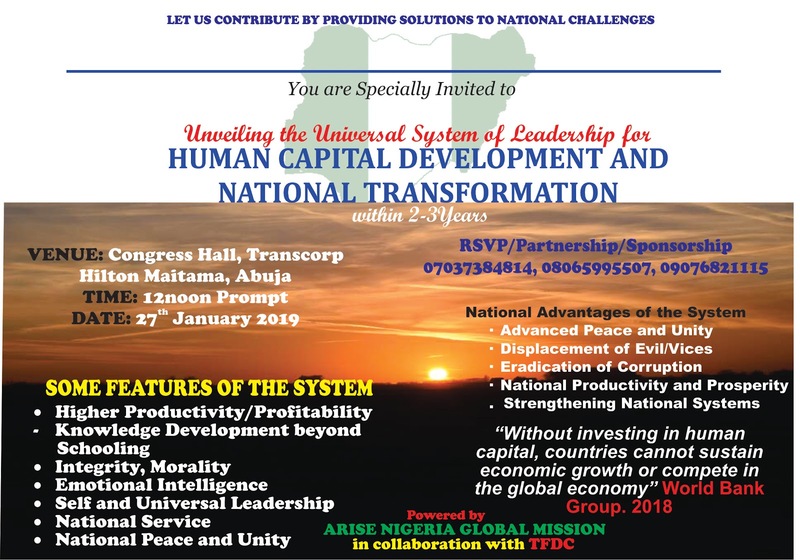 Now we need all stakeholders to advance the Universal System of Leadership towards achieving the desired and well deserved human and national transformation urgently in Nigeria. TIME IS OF GREAT ESSENCE NOW. 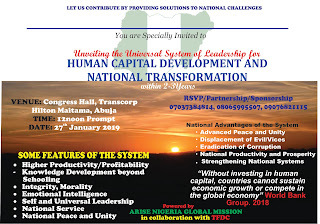 To know more, attend the Human and National Transformation Symposium by ARISE NIGERIA GLOBAL MISSION in collaboration with Time Frame Development Consulting (TFDC) coming up in Abuja, Nigeria. ARISE NIGERIA GLOBAL MISSION is a nonpartisan movement of all peace loving people in Nigeria and abroad with the conception for human and national transformation and for Nigeria to lead the world as a divine mandate of God. ARISE is an acronym meaning Agenda for Reforms and Initiative for Sustainable Economy founded in 2011.